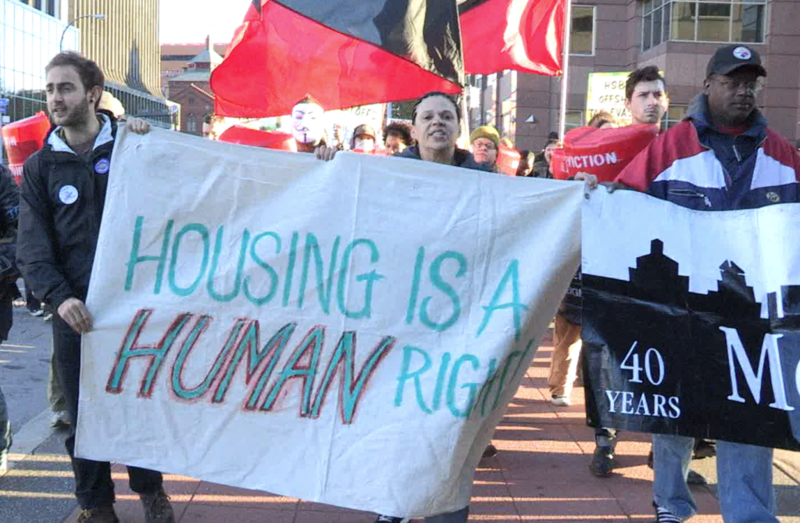 A detailed look at the production process for our documentary Expect Resistance, which looks at the growing housing justice movement by looking at Take Back the Land Rochester. As many people know, this blog is also tied to a larger film project called Expect Resistance. This is a documentary that attempts to look at the larger housing movement by focusing on one of its more visible branches, Take Back the Land Rochester. Here it looks at the people involved in the organizing, its connection to the growth of the Occupy Movement, and the specific people who are actually fighting the foreclosure of their home. Here is a detailed look back on the process of making the film now that production is coming to a close. A short version of the project has been completed, and the feature film version will be done towards the end of the year. There is a filmic perspective that has been lacking. After the political upheavals of the sixties, the point of documentation and art has left the activist sphere. Instead it is almost solely discussed from the outside, finding its base in the bourgeois media and a sense of objectiveness that is shifting strongly to the right. A political documentary hits a period renaissance, there still lacks a style of internal filmmaking where the filmmaker finds their foundation on the inside. It is with this concept in mind I developed the project that would become Expect Resistance. In 2008 we began to hear rumblings of a financial crisis, soon to become a collapse that would completely decimate the economic growth for a generation. Housing values became central to this, with foreclosure becoming the new normal for working class communities. Neighborhoods around the country began to be the victims of a class-based assault of almost military proportions, with banks having to ramp up their removal efforts after property values plummeted. It is in this environment that the Take Back the Land movement was developed. Beginning in Miami, Florida, the movement takes on two principle tactics. First, it defends people from foreclosure-based eviction with community organizing, neighborhood solidarity, and physical blockades. Second, it supports homeless families to illegally move into empty, bank owned homes. Here they would fix them up, make them livable, and become regular residents of a community. This was a movement I was already on the fringes of, and when my thesis project began to be touched it was already in my mind. The idea came to the front of my mind for a number of reasons, not the least of which was the fact that had confrontation and direct action at its heart. I knew that eviction blockades were “scenes” that played out with an implicit drama and antagonism, which I could tap into as a way of creating a compelling human drama. At the same time there were elements I found fascinating as a filmmaker and storyteller, especially in the way that people bypass political and social systems by localizing direct action. There were already characters here since people moving liberating vacant homes and defending their houses from foreclosure, respectively, had complex issues and had already made difficult choices about how to fight back. These were real people who were becoming inspirational in their struggle to survive. At the same time, there were also hardened activists that would become engaged and committed to making this a long-standing movement with the power to inspire revolutionary change. This again made them unique, and since I knew many of them already it would be easy to be allowed in personally. In my previous documentary projects I had began to develop a production style that was looking more and more effective in certain areas, especially when focusing on characters and creating a structure that was based on scenes. The concept for this project would then be to really allow characters to tell the stories and ideas, and to shoot with the idea that individual actions would make self-contained scenes that would be structured into a narrative. Along with that I had some different ideas about what other aesthetic and production elements would be included, but I did want to make music a driving part of it. The project ended up taking place of 17 months with dozens of shoot days and a couple hundred hours of footage, making it the largest work I had ever done. It changed constantly during the production, but the focus on characters and scene structure was always at the center of it and drove my decision-making. The final film ended up being adapted from real world circumstances, the way that the characters and I changed over that time, and how a real social movement was born and evolved. There’s a unique element at play when you are beginning a project that is tied to a career or educational trajectory. You want to create something that can be seen as a culmination of your education, which means both challenging yourself and showcasing your talents. There was an internal debate as to whether or not I wanted to take on new production challenges that were different than previous projects I had taken on, or to look at where I was strongest and then try to take those up a level. The decision I eventually made with my first proposal was a little of both. I would create a project that was centered on the things I thought I had experience with and had executed successfully. This meant drawing out characters and their stories through intensive interviews, discussing social issues with personal narratives used to draw a connection, and using event situations as a way of creating set pieces. I was going to build on this by including highly stylized recreations and include animations as a way of increasing the production value and strengthening my production background. The reality of the production put both of these ideas into focus. The first several days of production were incredibly controlled as we were figuring out exactly how the shoots were going to go. This began by filming two press conferences, a meeting, and a brief rally. Once we entered into the real events around Occupy Rochester it became clear that scenes that would end up in the film were going to be constructed from moments of confrontation, and those situations of confrontation were going to lack outside control. The first major march for Occupy Rochester, which was the Zombie Walk the ended in over thirty arrests in Washington Square Park, was chaos the entire time. Though I had secondary sound I had to lose it almost immediately, and quickly gave up on the tripod. Instead I used an assistant to help with camera issues and to give me stability. Every time I made a choice to return to the tripod I lost mobility and gave up important events that were shaping both the growing movement and were critical to the film. A choice was presented very quickly that if I was to remain in the middle of things I was going to have to remain completely free to move, which meant lowering the production value and maintaining hand held camera motions during dramatic events. This allowed me to interact directly with the characters as a person rather than just a filmmaker, and this allowed them to open up and to give me a perspective as an insider. This was invaluable, and from then on I was able to gain a clear image on how I was going to produce each segment. This was especially true when there were going to be legal issues, such as direct action or civil disobedience where arrest was possible. Tripod, lights, and non-sync sound were used when the situations had less interference, but I needed to have a strategy for how to remove any “weights” and go hand held when I needed to. This also affected the camera choice, where the Canon XF-305 ended up being perfect because it attuned better to hand motions and the quality of image was going to be consistently good. The Canon 5D and 7D, as well as the Lumix GH1 and GH2, were used for b-roll almost exclusively or in situations where we felt that a shallow depth of field was going to be acceptable throughout. The XF-305 also allowed for Auto controls that were fairly accurate, and this was important in situations of low light. While auto-focus and auto-iris were never used during the production process unless there was running involved by the cameraperson, the “full auto” setting had to be used when we were in extreme low light situations. For example, during public occupations in a park or families moving into a house without power, it was the only way to get an acceptable image. From there it was easy to adjust it in post-production. At the same time light was treated differently, and keeping with the new shooting style it often allowed the night scenes to have their own look by having heavy reds and yellows overlay the image. The realities of shooting the scenes allowed the function to determine the style. From here the idea of putting in heavily stylized recreation and animations seemed completely out of place, and would have trouble re-creating the intensity that we saw in actual confrontations and illegal direct actions. The cameras chosen were versatile enough to capture images that were almost universally usable, even though stability was often sacrificed for access. The moments when aesthetics were an issue were less in moments when conscious choices were made to use on board sound or natural lighting, but instead when outside microphones or lights were used an failed. Lavaliere microphones often had problems during sit down interviews and instead the on board microphone had to be used, which was never ideal in a staged setting. This also reduced the crew size significantly. The original decision was to have several Directors’ of Photography instead of a single one because many shoots would be spontaneous and we would not be able to maintain a consistent shoot schedule. Events such as eviction defenses would often get very little notice, and therefore I would need to be incredibly responsive. The plan was to then find several cinematographers that I could keep in contact with and when events would come up I would see who was available. This tended to work out well, but often times I would have to act as the cinematographer and just take an assistant with me. I had always planned to be one of the participating camera people, but this happened more often than not. This had an implicit affect on the style as many major scenes had me at the helm of the camera, which meant that my internal connection with the subject meant the camera needed to be thrust into the middle of things. This altered how I worked with the other cinematographers where I asked that they work very close to the subjects, often times positioning the camera closer to people than they would normally be comfortable. Non-sync sound was used occasionally for cohesive scenes, but usually it was more of a burden on the production than it was a benefit. It would restrict movement dramatically and not allow us to follow action as it was happening or to respond quickly. When using a boom pole and shotgun microphone we were also not able to get a large blanket of sound, which was the best bet in a chaotic situation. This meant that using an attached shotgun to the Canon-XF was the best choice, and only using non-sync when we were using DSLRs. These are some of the most chaotic possible situations that I could imagine, often times where police are rushing in and people are yelling and running. This meant that having an awareness of my situation during production was important and many things were lost. It was important to make sacrifices for access, which meant that I had to simply allow for shaky camera and audio at times. If I was to be concerned with stability and clear audio at all times I would have been making a different film, one that looked at the subject from the outside. This style actually plays to the benefit at times since it immediately communicates a certain visceral feeling to the audience about what it feels like to participate in mass actions. The key idea of the project, which was the main focus of the proposal, was that it was to be produced with coherent scenes that could often reflect a narrative sensibility. This was not just an essay documentary with a thesis supported by interviews and statistics. Instead, those elements needed to only support characters and scenes that outlined actual events in a story structure. The main elements here were to be the concept of direct action and disobedience, so those needed to be seen in real ways as they were happening. When events like these occur they are scenes in the participants’ lives with a real structure: a beginning, middle, and end. That structure was then to outline how we would approach the filming of the project, and how we would approach each shoot day. It also allowed me to create a preliminary outline for the film that, though it changed several times, allowed the massive editing process to become manageable and focused. The first coherent “event” day was again the first Occupy Rochester march and series of arrests. The end result of this day was not known in the beginning as many participants simply thought that they would have a press event, march to the park, and begin the semi-permanent encampment. Once they arrived at the park there was a notification that they would be arresting “trespassers” who attempted to stay past the park’s official closing time. From here I extended the day and followed it through the General Assemblies where they discussed the approach, the negotiations with the police, the stand off and arrests, and the aftermath. This made up a cohesive scene that was then treated semi-autonomously as a way of maintaining the integrity of its portrayal. The first edit of that scene came shortly afterward so as to keep the memory of the events, as it was being cut, which was important, as my role of the filmmaker had shifted from onlooker to participant. This also opened up to the way that commentary, criticism, and development would happen through social media (which will be discussed later). Many scenes were then approached the same way if they were event based. If a scene did not end up in a final cut of the film it could be mined for b-roll associated with an interview or montage, but only after the context had been provided. Now that protests had been introduced as a subject of the film, other protests could be shown without a detailed explanation of everything that occurred. These scenes ended up making the bulk of the film, while interviews and cultural commentary simply structured the film and created a skeleton. Leonard, as one of the main characters, had both sit down interviews and scenes of active events. This included the opening sequence where he discusses his house, the episode from the middle of the film where he confronts Wells Fargo, and the scene at the end where he goes to court in a final bid for his home. In an effort to draw both on the cultural inspirations behind Take Back the Land and Occupy Wallstreet, as well as to give certain aesthetics that have cultural significance, a focus was made to include contemporary music that would drive the narrative. The project itself has outside appeal, which was also a benefit during fundraising. I contacted several hundred musicians, record labels, producers, and managers to get rights to songs, which came through en masse. I had a large library to choose from and found songs that really spoke to the subject matter and the ways that the scenes were being constructed. The project has political implications so free rights were often given up by artists that shared certain views about the foreclosure crisis and wanted to contribute in any way to a project that would address this. Often times artists even shared around information about the film and my fundraising pages. From here we ended up with around 20 individual songs from a range of styles that are complimentary and set an emotional background to many of the scenes. This was especially true in the montage sequences where it was more important to give a sense and sensibility than hard facts about events. We knew the how and why of the protest, but now it was important to have convey some of the transgressive feelings that come with being part of a growing movement. The scene-focused shooting pattern was set in place from the start, but this format began to develop a new element that became central to the project. Right from the start I created a social media campaign, largely because we needed to support the fundraising attempts. We began with a fairly lofty Kickstarter goal that we met, and then later an Indie GoGo campaign. Both of these required that we connected with as many individuals as possible. One of the things that made this project seem like it could be successful right from its first idea stages was that it could tie into a possible funding network. There would be a number of different organizations and social groups that would have a vested interest in the success of a project like this because its possible effect on social movements and as an educational tool. The very existence of a film looking at the housing movement as it is about to see a potential period of growth is going to be huge on its own, which means that small amounts of money may be available without any influence desired. I began by making a large list of groups that may be interested, which included left-wing political parties, activist groups, housing organizations, soup kitchens and shelter, and dozens of other sub-categories. This equaled to around 1,300 organizations, all which were emailed with the information of our project and a link to the Kickstarter. Next a Facebook page for the film was created with information about the film. This was regularly updated with news about housing justice and the Occupy Movement, along with things like photos and fun things that were correlated. These were tied with multiple other social networking services like Twitter and Tumblr to create a comprehensive web that supplemented the lack of a regular website, and got a lot more traffic than a regular site would have. This allowed for our first blast of funding that purchased things like hard drives, production tools, and transportation costs. As the film progressed the Facebook page, as well as the other social media departments, was constantly updated with production information. After the first cohesive scene was completed there were requests for footage put out by a variety of national news sources. I decided to do a rough cut of that first scene relatively quickly, intensely editing over a couple days. That footage was then sent out to different media sources and then shared via social networking. This got national coverage and posted on websites like The Huffington Post, Fire Dog Lake, and The Nation. It went viral on social media, being shared on pages and groups of different occupations and activist networks. The video, in its form, quickly became one of the pieces that became part of the narrative for both the local occupation and the movement internationally. From here the event, and the footage, began to be seen in a new light. Commentary began to shape my own perception of the event, how the characters were being seen, and how it fit in the larger socio-economic context. This developing criticism began to get to the heart of the produced segment as people began to really flesh out what they liked and disliked from the presentation. Since it was seen by a diverse range of audiences on a list of different locations I could aggregate what I was seeing as a response and create a general profile of what people were seeing from the content and the style that the video was created in. This drove changes in the way the next scenes were filmed, as well as how subsequent edits of the original scene were made. These were really an additional force in the shaping of the project, though they did not replace more conventional critical settings like one on one viewings with academics or activists. This began to also create a social “buzz” about the film, which gave me further access to a number of people and situations. As the project gained a certain amount of recognition through this process it became easier to approach people to participate in the film and even to provide their own media, like still images or music. It also began to extend my professional credentials about the subject, leading directly to other endeavors. This included the offer to write a chapter on housing movements for a new book on social movements around austerity movements, which will be out in 2014. From here I wrote for several publications, which has acted as a pilot into other fields. The film acted as a research and activity center from which I jumped into other types of media, which in turn generated interest and content for the film. This created a media web where all of the pieces were complimentary as the focus on housing justice was the glue that held them together. This is a force that does not just enhance one particular element of the process, but can take it all the way through post-production and distribution. The real benefit of enhancing the online presence is that once you have made it adequately available to the public you have people who have integrated your content into their social media lives. This is critical since it allowed me to amass a following as I go into the exhibition stages. When screening at film festivals, possibly getting distribution deals, self-distributing, or even raising money for any combination there of, this following will gain legitimacy to the project and can possibly give it the momentum it needs to succeed. This is especially true in the niche market of activist centered documentary, where those communities will remain even more committed to the project. This also ties the project to social movements, other filmmakers, authors, and more, since there is a community of commentary that this film can then be entered into. This again, allows it to ensure a place in the community beyond its initial completion. It will also help to ensure a practical branding for me as a filmmaker and author, which will be incredibly important as I head into the next project. I can then announce to the current following upcoming projects and can immediately tap into a certain collective interest to transfer to something fresh. The film has a few commentators, two of which hold a high profile status (Elaine Bernard and Noam Chomsky). The original idea of the film was to have a total of five commentators that have nothing to do with the core story and organizing efforts. We ended up with only three in the final film, which most people who screened the film in its various stages were perfectly fine with. Most people who offered opinions advised reducing the commentary and increasing the personal characters, a comment that became important as later versions of the film developed. The inclusion of commentators in a political documentary can often times be less than appropriate, and can even be a way of including a “star” factor by including well known people discussing social issues. This is not usually an admirable quality since it is often done to ensure audiences and distribution deals, but not necessarily because those people have the most to say about the issue. The people that I included were chosen for their ability to discuss the economy more broadly instead of housing specifically. The housing movements and their radical character come as a direct result of the financial collapse of 2008, and the foreclosures that followed through 2011. This is not a major part of the film since it has been so widely covered previously and is not something that would be addressed any better in this project. Instead we have a couple academics that are trusted and who can speak concisely to explain the core issues of the economic context, therefore setting the stage for the main characters. They are relaying relatively simple facts, yet their implicit authority allows those things to be taken more easily and with less explanation. This also has a secondary effect by creating an association between their public persona and the project itself. For example, if you see Noam Chomsky giving commentary that explains an economic issue, the point of view of the project is immediately shifted left for the viewer. This means that any assumption that there will be an attempt at centrism in the current socio-political framework is immediately dashed when this person is describing our situation in broad terms, allowing the audience to simply move into the piece knowing that there is a clear political perspective. This is a form of semiotics where the audience immediately understands that an issue is going to be approached counter to a few perspectives on economics, and therefore they are not expecting a rounded debate as to the nature of corporate regulation and fiscal policy. This is not a balanced film and has not interest in being one, so the sooner this is declared in the film the better so we can move into a substantive look at the characters and the political tactics of direct action. The debates in the film are how best to attack the corporate systems of class inequality, not whether or not foreclosures are fair. Interesting enough, utilizing certain people in the film also included them into the social network that permeates from it. Their participation, as well as people who aided the film in more remote ways (Astra Taylor, Michael Hardt, Slavoj Zizek), are all now connected to the project and will have a direct need to see the film. The project itself saw an incredible amount of roadblocks along the way, though relatively little from the subjects. I was already close to Take Back the Land and what would become Occupy Rochester, so I was kept in the loop as actions were happening since I was at all planning meetings. This still allowed for some things to be missed, especially if I did not estimate how important they would end up being. This includes the first weekend of Occupy Wallstreet, which I chose to skip since I thought it would be a small weekend protest. The biggest set back that followed us through production was the difficulty working with one of the subjects: Catherine Lennon. Cathy saw a foreclosure on her home several years ago after her husband died of cancer. Wells Fargo, who bought her loan from Country Wide, refused to give her standing and pushed through a rash foreclosure. Take Back the Land found her when canvassing a foreclosure list and she said that she wanted to stay in her home. She refused to leave and people arranged and eviction watch and encampment at her house. This delayed the eviction several weeks, and then the police can with around twenty squad cars and issued a slew of arrests. After a few days people got together and moved her back into her home, and she has been there every since. Wells Fargo and Fannie Mae eventually caved and negotiated with her, returning the property to her and lowering her payments. Cathy has then become involved speaking at many events, including things that were filmed at Occupy Rochester and other protests. She was the first person to grant permission of an interview, though she started rescheduling. She rescheduled fourteen times, often when a full crew was on the way to her house. I ended up not getting the interview, which meant she was not in the shorter cut of the film. This is still the only missing piece from the larger project and something we will have to find a solution too if we move into the feature length version. This longer cut will focus on three people’s foreclosure stories, while the shorter one just looks at Leonard’s. Leonard himself became hard to get in touch with, and it would have been nice to loop some of his interview and to do a secondary one. More of Leonard’s story would have been great, but experience with him was actually quite limited. The Windom Bey family, who I filmed with extensively, was actually quite involved and was intended to be the film. There were no sit down interviews with them as I chose to simply ask them questions during active situations, but in the final cut of the short film their situation was too complicated and it did not seem fleshed out enough to be the sole foreclosure story. Leonard’s was the most concise, but still could have been better. This could, however, be remedied by utilizing some extended footage from broadcast news sources. Additionally, the technical issues became monumental. I began the project working on Final Cut Pro, which I also had on my home computer. The project swelled and become quite large, in its final version hitting 3 Terabytes. My home computer eventually had trouble handling the full project, so I just worked on the school computers. I was then let know that they would be removing Final Cut Pro and I had a choice to make about what I was to do. After some thought it seemed like going to Adobe Premiere would be the best bet, which was software I had never used. The project transferred well for the most part, but there were a lot of problems with things like sound, placement, archiving, and other technical tools that it added several weeks of work simply to get it into the same position that it was in when editing in FCP. This became true again when it came time for color correction as there was no direct link to Apple’s Color, and my attempts to send it back to FCP and then to Color were a failure. I eventually went with Adobe SpeedGrade, but the computers were not powerful to take the entire project over at once so I had to restructure the timeline and send it over in newly nested clips one at a time. This meant that individual scenes were being color graded on their own. Each scene took at least and hour to send over and an hour to render, and since I did not know the software well I ended up doing only minor grades and an increase in contrast. About a year into the project my main hard drive was damaged and I went through a long, and very costly, process of trying to recover what was on it. This was unsuccessful in the end. Though most things were backed up well, a few things had been missed and I lost a couple protest actions and a couple of interviews, one of which I had to perform again. For two of Leonard’s scenes I had to go to the test export I had made of them for online posting and then use the color renders I had from their temporary color correction. This meant that I used the compressed audio and overlaid all of the color renders one at a time, which brought it back to a similar visual state. This was true of the first scene introducing Leonard as well as the Wells Fargo protest. This caused some problems, mainly with the first scene, since it had music underneath it and so the dialogue and soundtrack were on the same track. It caused additional problems finishing the edit for the Wells Fargo sequence, which was cut down to a third of its original length. These problems were eventually solved and some concessions were made in an effort to make them work. Generally, the size of the project was an issue throughout. The final cut for its original presentation of 34 minutes has around 800 individual shots. This came from almost 80 shoot days, as well as archival footage and photos, and outside music. This was a massive project and even the more powerful computers I was working on had some issues. This meant that I could expect the editing program to crash several times during most editing sessions and that other unseen errors were going to occur. It also was difficult to keep organized, but I set a plan for its Bin structure early on and tried to maintain it. The main organizational issues came when it transferred from FCP to Adobe Premiere and saw that things were rearranged and renamed. The size and length of the project all came up with departmental problems where there was come contention about its perceived length as a feature film. This is one of the elements that lead into the creation of the shorter version, which ended up stronger with the time I had. Scenes became more concise, characters more focused, and many things were left out that were not directly related. The Occupy Rochester encampment was first ruled illegal because it was in violation of the park’s restrictions, mainly against camping and about its listed hours. The first attempt at setting up an encampment brought the police and a few dozen arrests. This was not the end as another global day of action came up and local labor brought in support. There was again a large scale march, this time including most progressive non-profits, churches, and unions. Again, an encampment was discussed and there were numbers calculated to see if people should try to occupy the park after 11pm and risk arrest. At this point the first arrests were looking legally questionable on several different points, including multiple violation of First Amendment rights. This was the first occupation in New York State to be broken up, and one of the first in the country generally. The NYCLU were already filing briefs and they had sent legal observers to this march to monitor violations by the police if there were any. It looked like one more major stand would actually win the park over, forcing the local government to concede to this public pressure. It was with this second group of arrestees that I joined in, got taken into custody, and had to post bail. What I decided to do was to get the amount that would be assumed for bail, which was $200 for most people, and have that cash on hand with my assistant. Then I would stay within the park’s boundaries with the camera as long as I could before the police were going to make a clear advancement in. Right before they did I would hand off the camera, with instructions to my assistant for how the footage of the arrests was to be conducted. This is what happened, and she was able to follow me as I was being arrested and led to the holding trucks. Here I was packed in with four other people in a small shelf of a space before I was taken to the jail. The decision to do this took dealt with multiple consideration, not the least of which was about how it played into the production process. It should be noted that voluntarily joining in the protest in its most confrontational level is not something a regular journalist should do. Though objectivity does not always mean that you have to see two equal viewpoints about an issue, it certainly doesn’t mean going full force behind one ideological side. This was perfectly fine with me since I had, at no point, tried to assume that this was a story with multiple sides. I was coming at it from a clear angle and wanted to stay within that framework from start to finish. As one journalism student said when I showed this scene for feedback, “There is a difference between being balanced and being fair.” I was a journalism undergraduate and have worked in that field at different times, and I think that fairness was always on my mind even if I did not attempt to be balanced. The bottom line here was that a choice was going to be made about whether or not I was a part of a movement, or simply an observer. As has been stated earlier, part of my decision to make the film was because of my own connection with the activism itself and my passion for the issues. If I wanted to show committed solidarity with my subjects then I had to be willing to participate in the same way. This also created a strong bond of trust where there would be few situations where my motives could be questioned since I had shown a certain amount of commitment. Secondly, I also felt that this was an important tactical choice for the situation that was taking place. It was not just a moralistic show that I was willing to also make a sacrifice, but instead I saw the value of this specific action in a larger context of tactics. It also played directly into the conception of the film as documenting visual forms of activism. My participation was simply adding to this presentation, and by this there was an element of me as an important actor in a drama. This was not artificial, of course, since it had a pointed purpose. The other point that is important about this is that my participation should not be limited by the fact that I am behind the camera as well. Since I would feel the obligation to put myself on the line in a normal circumstance, it does not seem justifiable to step back simply because I am documenting the event. As the project began to be more focused and the clearer story thread for the shorter version was fleshed out there was a lot of discussion about exactly what should be included and excluded. Leonard began one of the main threads, as he was an affected person and the context for the housing movement as a whole in the film. The first rough cut that was created excluded any scene and mention of Occupy that was not directly related to Take Back the Land. This was preferred by some committee members that were designated with giving feedback and criticism, while others took issue with the removal of Occupy. I included Occupy sequences as an important part of the production plan, they were central to the editing, and really important to me as a way to understand the movement and the characters. I decided to make a final change where I removed one scene and added four short ones about Occupy that were in the original long cut. This meant that we went into a longer discussion of Occupy in the center of the film. At screenings some people expressed the same sentiment that the Occupy footage, while compelling on its own, felt like a sidestep to the more important story of Leonard. This actually echoed some perceptions from within the housing movement that thought large scale actions like Occupy were not as substantive as focusing on the stories of working people who already have these struggles against capitalism in their lives. Other people who saw the project as it was, usually more connected to the movements on the ground, appreciated the presentation as it was now with a large amount devoted to Occupy. My actual feeling about it is a compromise between the two, and really only could have been perfectly realized with more production and a larger product. The Occupy footage may not have been as overwhelming if it had not taken up as large of a portion of the film, as would have been true in a longer version. Also, if scenes with Leonard were put in between some of the Occupy scenes then it would have kept him at the forefront of the story. This would also have been true if most the active people in the Occupy scenes had been introduced earlier in the film. The longer version of the film really does focus on the larger movement aspects and large-scale, public actions. It also would have had the other characters going through foreclosure (since three sets of foreclosure survivors were actually documented), so you would not lost the personal characters when going into the Occupy footage. It could also be remedied by either shortening the Occupy footage as it is, or going back to the previous cut where Occupy is only in the background as a support for the main subject of Take Back the Land. This has not been uniform in its discussion, so for festival purposes the version as it was screened was only minorly altered to remove post-production errors. A longer version of the film will be cut together (around 60 minutes), and the criticisms of the shorter version will be one of the main elements that go into the changes made. This will likely mean highlighting characters more specifically and toning down the Occupy footage. As some people have pointed out, we have already seen a lot of Occupy Wallstreet as a public entity, but we do not know a lot about housing direct action or the people going through foreclosure. This would mean that I would return to a focus on Hubert Wilkerson, a formerly homeless man who organizes in Take Back the Land. He was almost completely cut from this version, but is a compelling character and important to the discussion. Cathy Lennon would need to return to the longer version as well, though I would either need to scale her section back or ensure that I can get her interview. I would also include the complex story of the Windom Bey family who, through a city error, acquired thousands of dollars in code violations that were added to their taxes in a city foreclosure. The three stories add distinct things to the film, and these two also participated in the large actions that are tied to Occupy Rochester. This would draw the connections between the housing issues and the Occupy spectacle more distinctly and would make it more indispensible to the final film. The real disagreement often comes between the types of audience watching it. People more concerned with film appreciate the character stories best, and those who are active in organizing like seeing a film that has an internal view of public protest actions. My instinct is to again broaden up the project so it appeals as a film to an audience that may not be politically affiliated, though my own personal sensibilities appreciates the uniqueness of the way the Occupy scenes were filmed and presented. This is not a political film in the conventional sense. There is a political component, and a clear point of view, but its primary purpose is not to make an argument about housing justice. This should seem obvious from the beginning of the film. By allowing a clear point of view that reflects an anti-capitalist sensibility, our starting point is that there is an unacceptable amount of housing inequality at a systemic level. The film is really then about the idea of direct action. What this really means is that we attempt to create a character out of an abstract concept that ties political identity with engagement and community. Direct action, while hoping to avoid redundancy, is acting directly. It is avoiding mediation through institutions of either capitalism or the State and acting directly to meet the needs of individuals or the community. This runs completely counter to the solutions to the housing crisis poised by both the institutional left and right. The idea presented here is that struggle should happen outside of the accepted political channels and instead happen directly in the community, by either liberating empty homes or defending against foreclosure and eviction. This is a different concept and hails to other elements of struggle, such as the union concept of taking the struggle for fair working conditions out of the political sphere and instead locating it in the workplace itself. This is clearly just an idea and not a substantive character, so the challenge was in how to give it the force to create a film around it. The decision that I made was to look at a movement that shows direct action in such a clear and “common sense” way, with Take Back the Land being the best contemporary example. Through that the characters seem obvious as people involved behave not like politicians, but with a certain dramatis since there is risk and passion involved in direct action. For the affected people, there is the personal crisis of foreclosure at play, so their motivations for action become incredibly crystalized. The method and means of direct action are based in these people’s actual experiences and personality, so the discussion about the concept is really through the ways in which they are engaging in struggle. Direct action is supported as a social program because it can adapt to situation sand personalities, it creates a life that is less mediated, and it has the ability to locate the broad struggle into a context that is very specific. All of this occurs as we see these people taking up their circumstances, whether it is Ryan Acuff developing a social movement or Leonard Spears trying to stay in his home. I began to change the way I determined success in this discussion. It was less important for the audience to locate the terminology and more important for them to absorb the human stories since the direct action, as it were, was in their lives. The way they lived, the drama of their situation, and the triumph of their spirit was all an element of this action, and the character of this abstract concept became the facts of their story. If direct action was at the core of their narrative and character, then it was best to keep their story and personality at the core of the film. The final product that I have delivered is much closer to the original version of the film than I thought it would be. After the project started and the Occupy Movement provided a massive growth in movements targeting economic inequality with the use of land occupations, my project became massive. A feature-length project became the target once connecting semi-autonomous scenes onto the skeleton of interviews and montage could see the project. When shared with a serious committee the difficulty of actually doing a feature project in the prepared time period and format was going to be difficult, and it reminded me that the most important principle to live by in filmmaking is that concision is always the best choice. This often feels counter intuitive in political documentary where every piece of footage seems like a critical document of an important event that has taken place. This is not what filmmaking is based on, however, but instead trying to create a new item that moves beyond its parts. The final film is an object that represents the choices made, both in creating the clips as well as arranging them. It was better then to remove many scenes and shorten others, even if there was quality material that was important to me. The documentary editing process is much more like a screenwriting project than narrative editing, which means you often go through dozens of drafts. You can remember some of the same lessons from narrative screenwriting here; such as ensure each scene progresses the characters and main narrative. An old adage for screenwriting is to locate your favorite line and remove it, and this was always in my mind as I removed wonderful clips that just did not have a place in the final film. There is still a longer version in the works, but it is a completely separate entity that will have to be considered differently because the characters will be expanded and the pace and character of the film will be altered. It will not simply be an extended version, but a wholly new project that approaches the same material. My main process for editing, as well as for writing, is to edit long and then to scale back. This allows me to work out a narrative for each scene individually and the film as a whole before I begin taking out everything that is unnecessary. For this film I set very clear time goals for each scene. This meant that a scene that may have been running fifteen minutes I determined that it could not be longer than five minutes before it overstayed its welcome. Once I got it there I would make a strong assessment, sometimes with outside opinions, and then see if I wanted to scale it back further. Some whole scenes were removed very close to final delivery, choices that were hard and necessary. The final film was one I was proud of and stays true to my vision of a project that looks at direct action through characters and narrative. It includes a look at the broad range of actions, ties our individual housing movement to the larger social actions and socio-political issues, and reflects a recent history where massive systemic change seems possible. The passion of the characters, and even myself as the character behind the camera, seems palpable and makes many moments have lasting electricity. There are still some serious disagreements about what is important in the film, especially about the importance of the Occupy scenes versus those that are focused on our main characters. This is debatable and different amongst different audiences, and this debate will inform the next approach at this footage and subsequent projects that meld political and personal stories. The first screening process went well and there were some clear discussion points made, though some of it was disconnected from the difficulties of the production environment. Aesthetics are mixed in a film like this, and the main thing I would have done differently is to simply do more to avoid some of the technical errors that were made. The project is now going out to film festivals, many of which focusing on social issues and student films. It will be sent to a nice range of film festivals for the short version and I will see what the response is there, though it may be a good option to distribute it through a progressive/radical publisher for DVD sales. I would then do a self-distribution plan for the longer version with Distribber for iTunes, Hulu, Netflix, and Amazon Prime distribution. For this the goal would simply be to break even since the self-distribution plan usually costs a base of $3,000, but would serve as a major career milestone. We will now be waiting to see if a west coast premiere will happen at the Mt. Hood Film Festival, the Bend Film Festival, or the Oregon Film Festival. The point of a thesis film is to show professionalism in your ability to lead a project and to show your creative skill. With this project I created something that can be a major piece to push the beginning of my career, but it is also a fully realized project that can contribute to a canon of radical filmmaking. There has never been a project just like this and it takes an approach this is rarely seen. The subject is new and the movement is growing, and this film can act as a participant just as I attempted to do when producing it. A Part of a Movement? There is a really valid question here about how this film can be a part of a movement that is evolving, while also having its own place as a separate entity. The film is not designed to be a promotional vehicle for Take Back the Land or Occupy Our Homes, though it is a film that discusses the virtues of direct action by highlighting it through these movements. The argument here, if there can be said to be one, is to employ direct action and transformative visions at the heart of the movement. Take Back the Land, and much of the larger housing justice movement, rests on a “common sense” approach that is difficult to argue with at times. Simple exposure can only assist in growing its ranks, especially when its clear tactical arguments are made concisely and with some legitimacy. The film itself is not, however, the movement. The production of this film is not tantamount to organizing in my community, and its pure existence will not inherently energize the movement more thoroughly. There is often a strange disconnect for people associated with radical political action yet are artists where a subtle belief is that the creation of their art is a substitute for organizing. Art and media is essential, both as a means of expression and a way of developing a counter-narrative to the dominant institutions, but the streets will still be lonely unless everyone is there to take a stand. An eviction defense works when there are people to support it. Events work when they have been effectively outreached. Organizations and movements grow when people put in the work to make them do so, and transformation happens when the specialization that separates the “artist” from the “community organizer” gets severed. The artist should never ghettoize themselves from a movement thinking that their role is only in one specific way. People have preferences and skills, but that does not create an excuse to separate them from the action as it is happening.